A video to HKEPC and posted on YouTube (see from 2mins onwards) confirms the fact that only a 2-3 per cent OC via Base Clock adjustments will be possible. This is because Intel has tied the speed of every bus (USB, SATA, PCI, PCI-E, CPU cores, Uncore, memory etc) to a single internal clock generator issuing the basic 100MHz Base Clock. This clock gen is integrated into the P67 motherboard chipset and transmits the clock signal to the CPU via the DMI bus. This means there’s no need for an external clock generator that used to allow completely separate control of all the individual hardware. When you’re overclocking, you want to be able to push certain frequencies, such as the Base Clock and memory clock, but leave others, such as SATA, completely stable as they’re very sensitive to adjustment. Current motherboards allow multiple bus speeds because external clock generators are programmable via the BIOS. The report continues with more technical information and analysis. This fundamental design change will impact casual overclockers all the way to highly-regarded extreme benchmarkers. Don’t panic and switch to AMD just yet, motherboard manufacturers are looking for ways to circumvent the locked frequency. As Bit-Tech points out, locking the frequencies will essentially level the playing field among all motherboard manufacturers. By taking overclocking out of the equation, there is less reason to purchase a higher-end motherboard. If the past is any indication, this may not be as much of an issue as anticipated. Intel was expected to carry out a similar plan to limit overclocking before the release of the Nehalems core. Worst case scenario, Intel will still manufacture the unlocked K-series chips. End-users will pay a premium for those CPUs, but their overclocking potential will probably make up for the extra cost. Will AMD reclaim the overclocking crown? Will motherboard manufacturers discover a workaround? All this remains to be seen. Stay tuned. Hmmmm, this will really surprise me if it goes down like this. You take overclocking out of the power users hands, well, AMD is about to gain some new fans. That is, unless Intel is insanely fast at stock. That really hurt saying that word. Agreed...it seems like I have heard this story before..."Intel stops overclocking" but it never comes to pass. I'm just saying, if they did...and there was no easy way around it...I bet half this forum would jump ship to AMD. they claimed the same thing on the i7 series, Nahlem, didn't happen, they have said this a few times, never happened. But even then, sure we recommend things, but dell , HP and other OEMs still count for i would say %90 of their sales so it still wouldn't make a dent if they did it, sure people would run to AMD, but most people look at a computer on dell, look at the price and hit buy. Exactly, though I don't see how overclocking would hurt them if most of their sales are through the channels where people aren't overclocking. The enthusiasts would just go to AMD, which would be worse off for them. This could very well be just a way to entice investors by saying some individuals will now pay more for the same performance rather than buying a cheaper processor. Lots of companies like to fluff their stocks at certain points. They (intel AND amd) already tried, hard, once. All cpus used to have an unlocked multi. 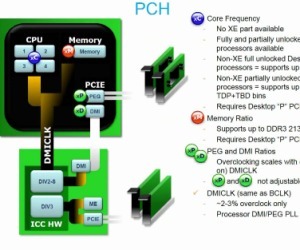 Maybe I am not understanding this but why would they release chips that can not be overclocked? As was stated above the OC world really isn't that big of a market. From what I would guess the base profit for Intel would be corporate deals. Which to my knowledge don't OC... Is OCing something that Intel really needs to limit? We would dig up the old Gygax games and start modding the rules like the old days of the C64 and 2-386:rock: We would go back to DOS and start rewriting the way memory is accessed so that we could have more than 640K (I had my MS-DOS rewritten to have 720k free, Win3 did not like it but the Duke did). We would Go back to Basic and start writing our own dice programs for AD&D and AD&D 2E because we were cool back then. There was an issue at some point where some businesses were buying cheaper chips, overclocking, then selling them at the faster speed. Don't really believe that is going on now. 1) Analysts already figured out that they would have a net profit increase even with some switching to AMD. People would be forced to buy more expensive CPU if they wanted more performance. With the branding that Intel has over AMD, they would lose some, but keep the majority. 2) Making certain statements help to increase their market value. Great for the company to buy and sell stocks at the right time. 4) Decrease costs of support, now that you would not be able to overclock, the settings would all be set to specific ranges depending on your chip. This would limit peoples ability to mess up their settings and have it set them correctly. There would be less calls to Intel and/or less RMA'd chips. OEM's wont jump cause we do, they know better, they will go with who ever can offer cheap bulk prices which will be Intel, sorry, but enthusiasts jumping to AMD will NOT change anything for Intel or OEM's, we are not that powerful a force. Sure, AMD had a better CPU back in the day for a while, but OEM's still sold Intel and Intel out sold AMD all over the charts up and down in every market, so that is proof we don't have the power some seem to think we do, otherwise AMD would be a lot higher than they are now from that era. AMD needs to hire a new marketing department, get the same company coca cola uses and watch AMD sales skyrocket. It is really unfortunate since mostly ENTHUSIASTS buy these chips, which for the most part LIKE TO OVERCLOCK. It seems like a backwards step for intel, seems like AMD will once again assume the position of power in hardware overclocking. This is really sad to see since most pc enthusiasts base their purchases on OVERCLOCK-ABILITY, I still find it hard to see what intel is trying to do, honestly if they are trying to tap into the uninformed pc user-base they are chasing a ghost. I would switch to AMD for my primary rig without a doubt. Provided they wouldn't do the same thing on their next release. A friend of mine who is working in industry has learned that Intel will be preventing Lynnfield overclocking capabilities. First of all Intel will remove 4 pins from LGA1160 socket and it will be called LGA1156.